This sensor detects changes in air pressure at its two ducted ports. 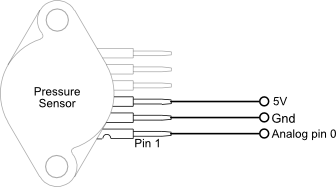 The output of the sensor is an analog voltage that varies depending on the pressure. The pressure sensor can detect changes in both positive and negative air pressure. Positive air pressure is equivalent to blowing into a tube. Negative air pressure creates a vacuum, similar to sucking from a straw. To connect the pressure sensors to the Arduino Shield, attach the three leads of the device as shown in the figure. The sensor is a 6-pin device, but only pins 1-3 are connected. 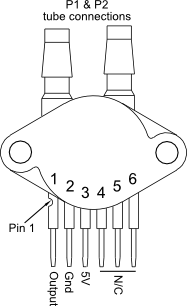 Note that pin 1 is denoted by a small notch. Although the leads on the pressure have the standard 0.100" spacing, it is recommended that you connect the device to the Arduino using male-female jumper wires, rather than plugging the sensor directly into the breadboard of the Arduino Shield. This allows you more flexibility in connecting tubes to the sensor. This carrier for ST’s LPS331AP digital barometer measures pressures from 260 mbar to 1260 mbar (26 kPa to 126 kPa) with absolute pressure accuracy over temperature down to ±2 mbar (0.2 kPa) and typical RMS noise of 0.02 mbar (0.002 kPa) in high-resolution mode. These pressures can easily be converted to altitudes. The SparkFun BME280 Atmospheric Sensor Breakout is the easy way to measure barometric pressure, humidity, and temperature readings all without taking up too much space. Basically, anything you need to know about atmospheric conditions you can find out from this tiny breakout.